I always love it when I arrive home to find a surprise waiting for me in the letterbox, although I really didn't like the very surprising electricity bill that arrived last week! Luckily, the surprise that I received on Monday more than made up for it. 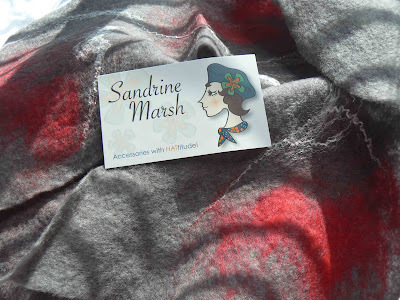 The very lovely Sandrine sent me one of her amazingly beautiful hand-felted merino and silk scarves. It's the perfect accessory for the move from Winter to Spring, the colours are just perfect for Melbourne, and it also matches my gorgeous red beret. I'm going out for lunch on Friday for my mums birthday, so I'll definitely be wearing it. Thanks so much for the surprise Sandrine. Happy Birthday to your Mum for Friday! Beautiful, what a lovely package to come home to...Looks so comfy!!! Wow,you will be warm and stylish. Your new scarf is beautiful! Sandrine makes amazing felt creations. You will look very chic when dining out with your mum on Friday. Wow, who's a lucky girl then? I wish I arrived home to those sorts of packages in the post! looks so nice and warm...bet it feels great on! Your studio is looking very inspiring! Love the orange, green, and pink containers!